Marvel Cooke, a seasoned African American labor activist and member of the Communist Party, wrote this set of investigative reports for the New York-based radical newspaper The Daily Compass in January 1950. For Cooke, it was a return to a familiar setting: she and Ella Baker, the famous civil rights leader, had co-written a groundbreaking exposé on an earlier iteration of the Bronx Slave Market in 1935 for the NAACP’s journal, The Crisis. Cooke’s analysis here is worth revisiting for several reasons. Not only does this represent an important attempt at conducting a form of workers’ inquiry among black domestic workers, at that time still a mostly unorganized sector of the working class; she also picks up a line of argument that resonates with other currents of black radicalism (including Claudia Jones, W.E.B. Du Bois, C.L.R. James, and others), tracing the survivals of slavery within the industrializing northern ghetto, where recent black migrants encountered new forms of extra-economic coercion and superexploitation. 1 Over the course of four articles, Cooke demonstrates how the set-up of these “slave markets” across New York City, where women stood on sidewalks near department stores seeking offers for a day’s work, engendered isolation (their actual workplaces were always changing, from the Upper East Side to Long Island) and depressed wages through competition (they had practically no bargaining power). In her personal experience as part of the “paper bag brigade,” Cooke details the the grueling nature of the work and the overt racism often encountered, as well as how the informal wage agreement made procuring daily necessities ‒ transportation, food, etc. ‒ a strenuous task. She ends by emphasizing unionization and struggle as the principal means for abolishing these markets once and for all. 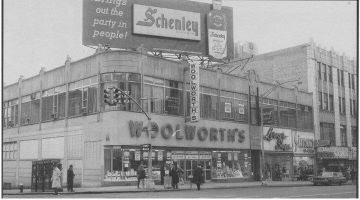 Even though the Woolworth’s on E 170th St in the Bronx has long been shuttered, Cooke’s reports remain essential material as we continue to think through the connections between migration, racialization, and domestic labor today. 1. ↑ For an excellent overview of Cooke’s contributions as a radical journalist and activist, see Lashawn Harris, “Marvel Cooke: Investigative Journalist, Communist and Black Radical Subject,” Journal for the Study of Radicalism, 6.2 (Fall 2012), 91-126. 2. ↑ Editor’s note: the use of this racial slur is unfortunate, but we have retained it in the interest of historical accuracy. Marvel Cooke (1903-2000) was an investigative journalist and Communist activist.